My first bike track opening. A delightful short ceremony complete with a free BBQ at the end. Karen and I attended the opening the last remaining link of the Mullum Mullum trail; so now a 42 km off road circuit is now possible. The opening ceremony included a speech from the Manningham Council CEO and a smoking “Welcome to Country” by some aboriginal girls from a local school. I received a gum leaf as a ticket to the area. There was a ribbon cutting part but Karen and I, along with many others, headed to the BBQ at the end of the beautiful scenic 1.3 km walk along the Mullum Mullum creek suspended for quite a distance by impressive bridges and boardwalks. Just as well we left early because there was a long line stretching down the path for a free sausage. A coffee and cake bought from a vendor completed our lunch. Kyle and I attempted the ride from Eltham. 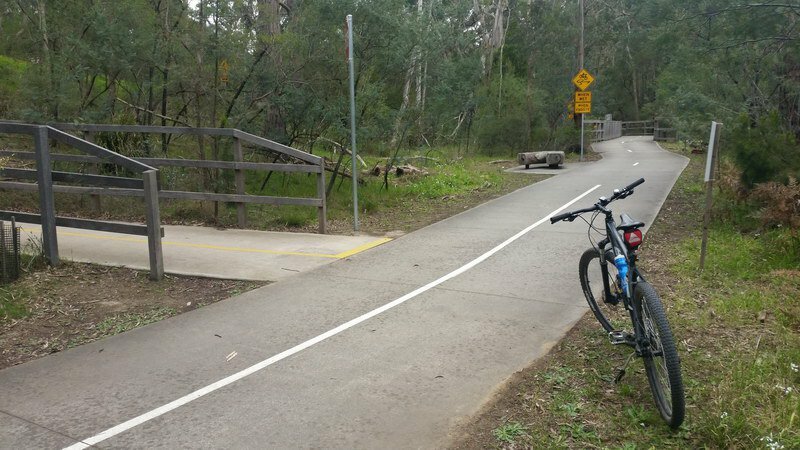 A short ride of 5 km gets you to the Main Yarra trail which is reached just over the Yarra River crossing at the southern part of the Eltham Lower Park. We rode east towards Beasley’s Nursery and then onto the Mullum Mullum trail. Eventually you reach a T intersection. Left takes you to Ringwood and right takes you towards Melbourne on the Eastlink trail. 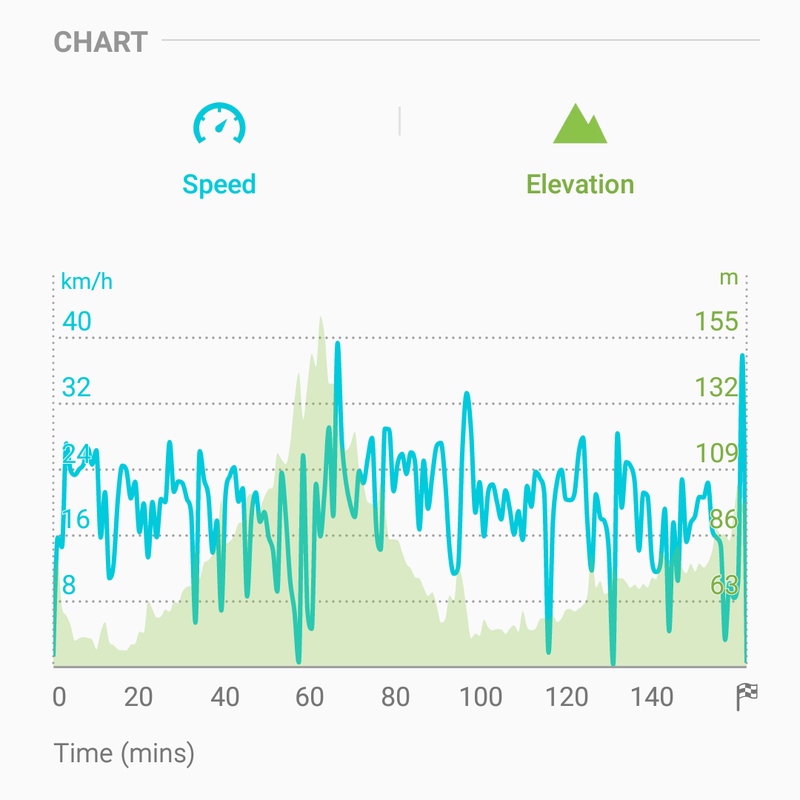 The Eastlink trail section is probably the hilliest, and the noisiest as for some distance you are close to the Eastlink tollway. Mullum Mullum meets the East Link trail. Riding the 42 km Mullum Mullum circuit. September 2018. Eastlink trail merges into the Koonung trail and this is quite a pleasing section to do. Turning right at Bourke Road for the Main Yarra trail takes you back to the Diamond Creek trail and onto Eltham. The 42 km off road circuit that’s now possible. 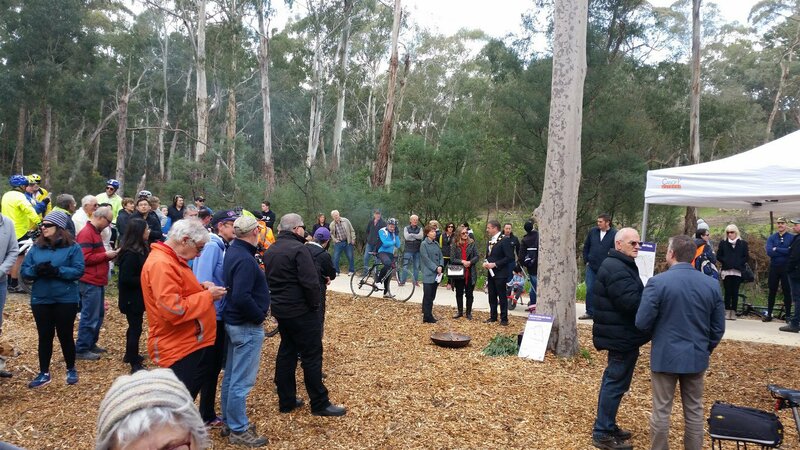 Mullum Mullum trail official opening, 16th September 2018. For the whole day we covered 52 km getting an average speed of 20 km/h.